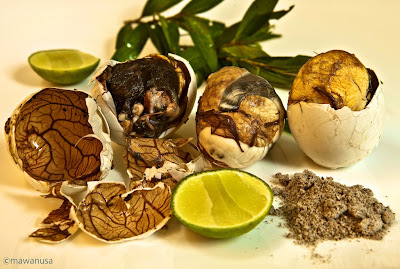 This kind of egg called ‘balut’ in the Philippines; ‘balot’ in Malay; ‘pong tea khon’ in Cambodia; ‘kai’ in Laos; ‘hot vit lon’ in Vietnam; ‘khai khao’ in Thailand. This vendor supplies ‘boiled egg’ is one of the most popular is few region in the South East Asia. Some believed that egg can give extra energy for some people and mostly consumed as snack. This boiled egg contain high protein and very delicious. I do not find many events like this in Indonesia region, but the salted egg consumed widely throughout the country. Prepare pot of boiled water and then cook the egg just like to cook a hard-boiled egg. And the street vendor will keep the egg warm all the time when served. I tried only one time to eat the egg in occasion of wedding party in one of the restaurant in Siem Reap, but I have witnessed many time peoples ate balut in Cambodia, Vietnam, Thailand and the Philippines. The age of egg about 17-19 days or vary in different province. Boiled egg ‘balut’ consume with mixture of fine salt and black pepper powder, lime juice, laksa leaves (chi pong tea khon), some chili dip and some salad. Another way to enjoy this egg: peel the boiled eggs and fried to crisp. Eat with salt, pepper and some salad or green mango salad. The way to have this egg is mixed as salad; or other way is to have it with lime juice, salt, pepper, coriander leaves and some salad. The mature egg about 19-21 days will give more develop chick and feather will start growing. Similarly to Thailand region, in part of Vietnam people consume the boiled egg with salt, pepper, lime juice or vinegar and coriander leaves or saw leaves. The balut being consumed after 17 days (as called balu sa puti) with salt, pepper or chili, and lime juice, or vinegar. The egg will not too develop and the chick will have no feather and the bones are soft. If you wish to visit South East Asia country, please do experience and try this delicacy. You will never forget for this fantastic experience. One of many things you may try before you die.